We have enjoyed a close and mutually beneficial relationship that has produced a remarkable dining establishment for our military customers. Read more. I have dealt with Pat Casey and Pike Corporation for over 18 years. Pat and his team have been instrumental in our success. Through his leadership and commitment to our success we have experienced increased sales every year since opening in December 1999. Read more. HMSHost continues to be excited about our business relationships at the Palm Beach International Airport in West Palm Beach Florida. You have been a great partner in the success at PBIA since 1998. 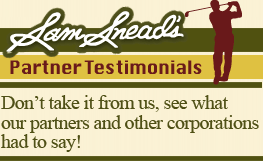 With the quality of operations such as Sam Snead’s we were already able to extend our lease through 2020! Read more. This Confidential Business Plan (“Plan”) describes and summarizes the operations of the Pike Corporation (referred to herein as “Sam Snead’s Tavern” or “the Company”). This Plan has been prepared solely for informational purposes by Sam Snead’s Tavern and is being furnished solely for use by the recipient in considering its interest in acting as an investor or investment banker for Sam Snead’s Tavern. This Plan has been prepared to assist the recipient in making his or her own evaluation of the Company and does not purport to contain all of the information that a prospective investor or investment banker may desire. The Company makes no representation or warranty as to the accuracy or completeness of the information contained in this Plan or made available in connection with any further investigation of the Company, including estimates or projections, and shall have no liability for any further investigation of the Company, including estimates or projections, and shall have no liability for any representations, expressed or implied, contained in, or omitted from, this Plan or any other written or oral communications transmitted to the recipient in the course of its evaluation of the Company. By accepting this Plan, the recipient agrees to keep confidential the information contained herein or made available in connection with any investigation of the Company. Without limiting the foregoing, the recipient acknowledges and agrees that: (1) the Company will not be subject to any liability based on the information contained in the Plan, errors therein or omissions, or was responsible for or participated in its inclusion in or omission from this Plan; (2) the recipient will not copy, reproduce or distribute to any third party this Plan, in whole or in part; (3) if either the recipient or The Pike Corporation elects not to pursue the matter, the recipient will return the Plan and any other material relating to the Company which the recipient may have received from the Company without retaining any copies thereof; and (4) any proposed actions by the recipient which are inconsistent in any manner with the foregoing agreement will require the prior written consent of The Pike Corporation. The Pike Corporation reserves the right to negotiate with one or more prospective investors or investment bankers at any time and to enter into a definitive agreement with a prospective investor investment banker without prior notice to any other person. The Company also reserves the right to not proceed with a transaction and to terminate, at any time, further participation in the investigation and proposal process by any party, and to modify data, documentation and other procedures without assigning any reason therefore.